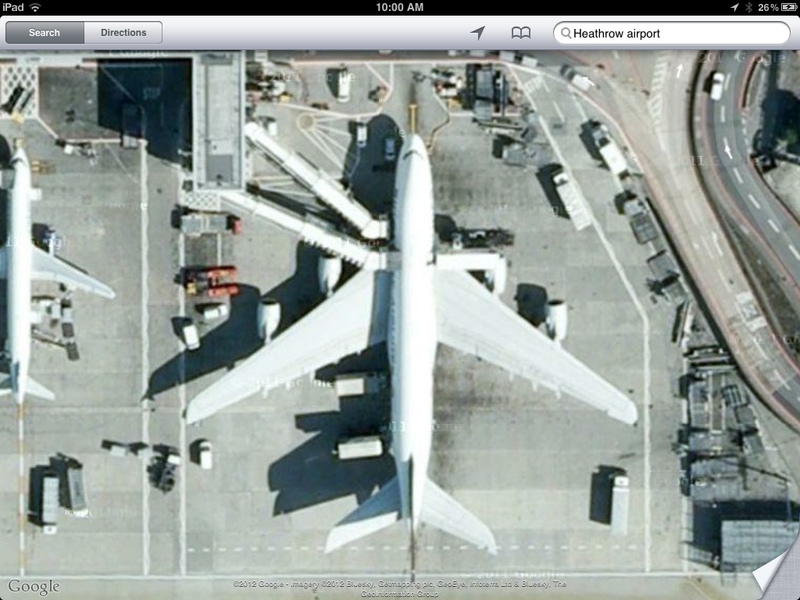 Here, by the magic of the electric interweb thingy, you see a Google maps satellite photograph of a Singapore Airlines A380 Airbus Superjumbo parked at Terminal 3 at London Heathrow Airport. Notice the clever dual aerobridge providing access to both upper and lower passenger decks simultaneously. Christopher and I were perplexed about how we were going to get wheelchair access to our seats on the upper deck when there is no internal elevator in the aircraft. As the French inventors of the Airbus would say, voilà! ~ by Garry on February 26, 2012.